You can count on the reliable engines and powerful hydraulics to boost productivity while you work with maximum efficiency and minimum fatigue in the comfortable spacious cab with ergonomic controls layout. Daily maintenance is fast and easy, with service points accessible at ground level, so you can keep your mini excavator’s uptime to a maximum. 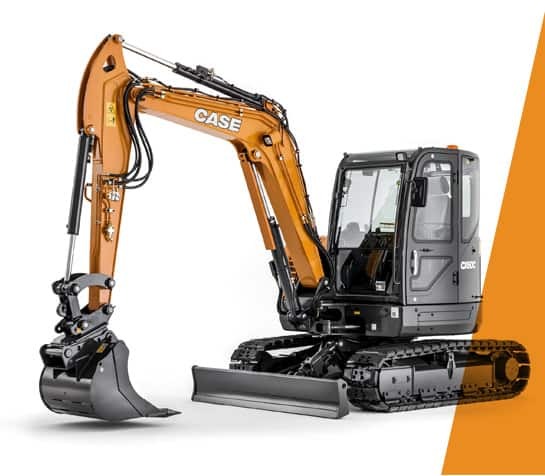 CASE launches a brand new range of mini excavators with 8 models ranging from 1.7 to 6.0 tons and raises the bar on productivity, comfort and safety. These new models are designed for performance and reliability, with components sourced from the best, world-class suppliers. The new C series are loaded with features that will make the operator’s work easier, more comfortable and more productive with no compromise in safety, which is a priority with CASE. CX17C and CX18C excel in terms of agility, because they are compact and fast excavators. CX17C has as a standard feature the Emergency stop switch that immediately stops the engine in case of an emergency. The middle range of CASE mini excavators, models CX26C, CX30C, CX33C and CX37C provide maximum versatility. These models are powerful enough for tough jobs, but nimble enough to access the most confined areas. Versatility comes also from a variety of features designed to improve productivity and performance that are available either as standard or optional equipment. CX57C and CX60C provide a spacious, stress-free operator environment, and feature excellent all-around visibility, ergonomic controls, adjustable seating and the best digital display on the market for ultimate operator comfort.